Virtual meetings are all the rage these days. More workers are mobile, the marketplace is global and technology seamlessly links people and places like never before. But to ensure that your virtual meetings are productive, you've got to do a little fine-tuning. 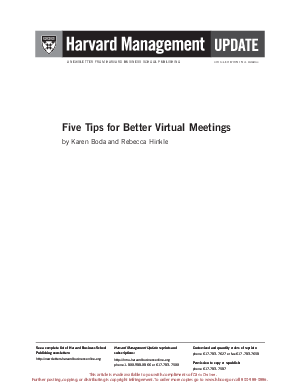 This new Harvard Management Update provides five proven strategies for delivering productive virtual meetings. From encouraging participant engagement to alternating time zone scheduling, discover how to energize your virtual meetings. Download the update to learn how to: . Increase the interactivity of virtual meetings. . Enhance collaboration and level the playing field. . Leverage technology to foster engagement and inclusion.